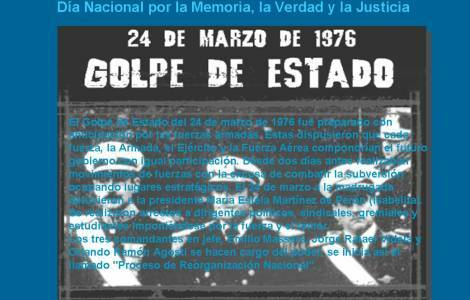 Buenos Aires (Agenzia Fides) - In Argentina, March 24 is now commonly called the "National Day of Memory for Truth and Justice" (Día Nacional de la Memoria por la Verdad y la Justicia), because it recalls the coup d'état of 1976, that is "the horror of violence, torture, murder, kidnapping, fraudulent business" are the words of Archbishop Jorge Eduardo Lozano, San Juan de Cuyo, who wanted to dedicate his weekly reflection on this date. In the request for prayers for peace and justice, Mgr. Lozano joined various bodies that work, together with the Church, for the defense of human rights. Among these, Catholic Action (CA) has invited to dedicate some minutes to "remember how evil sows violence in the life of peoples and how painful the path of encounter in truth and justice is". In the message for this anniversary, CA reaffirms "its commitment to life and to the construction of the common good and social friendship, in a more just, fraternal and united society". The text, sent to Fides, also remembers "the living memory of the martyrs of Rioja who will be beatified in a month, in particular Catholic layman Wenceslao Pedernera, victim of his faith in those tragic days, who asked his daughters 'not to hate' ". Pedernera, a farmer, organizer of the Movimiento Rural Catolico, was assassinated in his home by four hooded men who opened fire on him, in front of his wife and daughters, on 25 July 1976. He was immediately taken to hospital, where he died shortly after, he uttered words of forgiveness for his murderers and he told his wife and daughters not to hold grudges (see Fides, 10/24/2018). In conclusion, the text of CA, after recalling the words of Pope Francis, before the date recalling the coup that removed the constitutional government, "giving rise to the most dramatic and bloody process in our history", invites us to "strengthen the awareness that violence and death will never be paths of peace and justice".